We would like to welcome you to our home. During your stay we are available 24/7 to help you with any issues that might arise or questions you might have. The home is a 4 bedroom 3 bath 2 car garage with 3080 sq. ft. We have all the amenities of home including two 55” big screen TVs with DishTV & Wifi, 2 DVD players with over 200 DVDs. We have a gas insert fireplace in the living room. There are amazing views of the river from almost every spot in the home. There is also an outdoor grilling area. There is a 2 slip covered floating boat dock on the White River which has ample room for you to bring your own boats. You can launch your boats at the free public boat ramp at the Ranchettes which is only a 1/2 mile from the home. You can also have your river guides pick you up at our dock. There is great fishing off the dock. We are always catching rainbows, cut throats and browns. This stretch of river is world class trout fishing and it’s constantly producing trophy browns. There is 698’ of river frontage with a staircase leading down to a shoal area which is excellent for wade fishing and fly fishing. For a great fishing trip or boat rentals go see Ms. Debbie at The Cotter Trout Dock. Our home sits at the end of the road on just under 7 acres of secluded land with an abundance of wildlife. We watch golden eagles, bald eagles, hawks & great blue heron fly and feed on the river with numerous other species. Just to name a few we’ve seen on the property are white tail deer, chipmunks, squirrels, bobcat, turkey, red fox and raccoons. Across the river from us is all forest and a beautiful view of the Ozark Mountains. Enjoy watching the amazing White River as it flows by. It is truly a relaxing place. We catch ourselves sitting for hours just enjoying the nature that surrounds us listening to the river and the sounds of wildlife. We enjoy getting up early and having a cup of coffee on the balcony watching the fog on the river. We are just a short drive from Historical Cotter, The Trout Capital USA, which is a small historical town with a couple of cafes, The1930 era Rainbow Bridge. Also Flippin has a Walmart Supercenter and a couple of fast food places. Gassville has numerous fast food places, convenient stores, Mexican food and Bbq, burgers and pizza! Mountain Home, which is just a little farther from Gassville, has pretty much anything you could need or want in a little town, including great shopping and 2 movie theaters. Bull Shoals sits on the lake and has 2 huge marinas. It has 2 state parks with canoe rentals, hiking and fishing. Also in Bull Shoals are the Bull Shoals caverns. It has a couple of great cafes, bakeries, and a pizza place! It also has a couple of more upscale restaurants. Canoeing and kayaking on any of the many rivers in the area are breathtaking. Our favorites are the White River and the Buffalo River. There are plenty of trails for hiking, caves for spelunking, and antique shops everywhere. The property has plenty of room for children to run and play safely. Family fun is just a short drive away through the beautiful Ozark Mountains to Branson which is just an 1½ - 2 hours from the home. There are year round shows, Zip lining, Silver Dollar City, & Branson Landing. There is also Mystic Caverns & Blanchard Springs Caverns just a short drive away & beautiful, historical Eureka Springs is only 88 miles away. We would like to invite you to come and enjoy this amazing place and make memories that will last a lifetime! During your stay we are available 24/7 to help you with any issues that might arise or questions you might have. 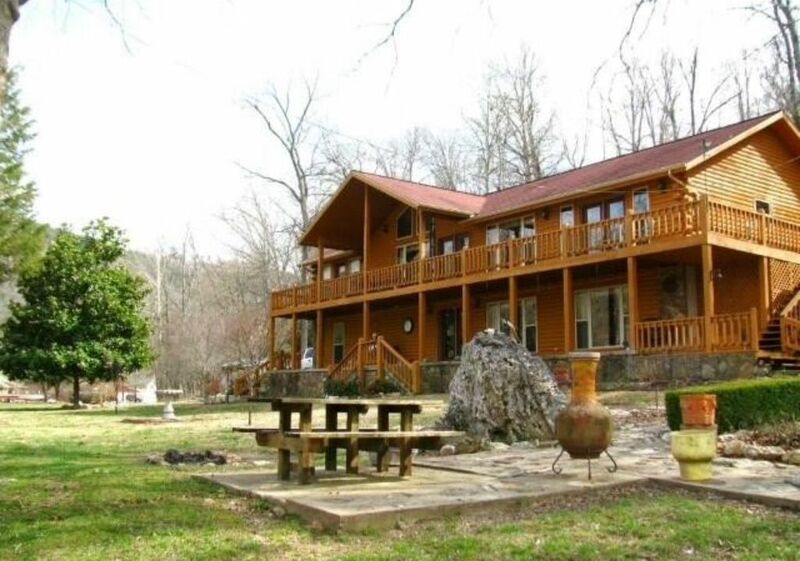 Enjoy the amazing view of the beautiful Ozark Mountains across the river! Relax on the deck or private boat dock and watch the beautiful White River flow by! Spacious yard overlooking the White River w/a fire pit & chiminea. Please feel free to use any wood on the property to burn. You are more than welcome to bring your own wood, too. The cabin was great with plenty of room for everyone. The views were amazing. Had a great time. Just need more pans and bowls in kitchen. If cooking for large group of people not enough of them. Loved it. Would go back next year! Wi-fi is poor, but everyrhing else was fine. Beautiful place on the river. Thanks for sharing your place with us. We enjoyed our short stay eminsly. We are so glad you and your sons enjoyed your stay! Looking forward to seeing you next year! The house was wonderful and was the perfect size for our large family. We enjoyed our stay, the house is beautiful and views were amazing. We will definitely be booking this property again! We are so glad you enjoyed your stay! We look forward to seeing y’all again!